FAYETTEVILLE, Ark. — Scientists studying graphene’s properties are using a new mathematical framework to make extremely accurate characterizations of the two-dimensional material’s shape. Graphene, discovered in 2004, is a one-atom-thick sheet of graphite. The mathematical framework being used is known as discrete differential geometry, which is the geometry of two-dimensional interlaced structures called meshes. 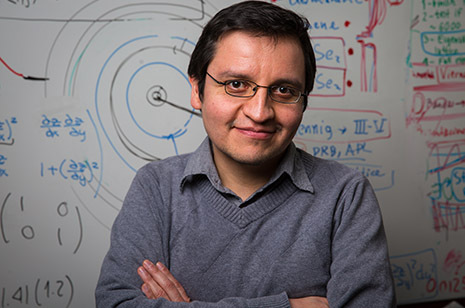 When the nodes of the structure, or mesh points, correspond with atomic positions, discrete differential geometry provides direct information on the potential chemistry and on the electronic properties of two-dimensional materials, Barraza-Lopez said. The application of discrete differential geometry to understand two-dimensional materials is an original interdisciplinary development, he said. An international research group, led by Barraza-Lopez, published its findings on Jan. 8 in the journal ACS Nano, in a paper titled, “Quantitative Chemistry and the Discrete Geometry of Conformal Atom-Thin Crystals.” A second article describing the research, “Graphene’s morphology and electronic properties from discrete differential geometry,” was published March 6 as a rapid communication in the journal Physical Review B.
Graphene was once thought of as existing on a continuum — think of a smooth, continuous “blanket” — but the new mathematical framework allows the consideration of the blanket’s “fibers,” which provides an accurate understanding of the blanket’s properties that complements the continuum perspective. The results for the study published in ACS Nano on Jan 8 were obtained through a collaborative effort with Alejandro A. Pacheco Sanjuan at Universidad del Norte, Barranquilla, Colombia; Edmund O. Harriss, a clinical assistant professor of mathematics at the University of Arkansas; Mehrshad Mehboudi, a master’s student in microelectronics-photonics at the University of Arkansas and Humberto Terrones, then at Pennsylvania State University, now at Rensselaer Polytechnic Institute. Collaborators on the rapid communication published in Physical Review B on March 6 were Pacheco Sanjuan; Hamed Pour Imani, a physics doctoral student at the University of Arkansas; Zhengfei Wang at the University of Utah; and Mihajlo Vanevic at the University of Belgrade, Serbia.